Anthony walked us through the power of the coded UI tests in VS2010. 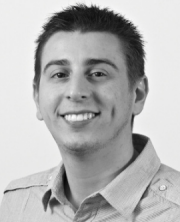 His process was to record a manual test of a checkout action on a cart in an online store. Anthony then continued on to modify that test into a coded-UI-test, where it would accept parameters (sourced from an XML file, and optionally any other source say a database) to repeat and test variations of actions on a User Interface. The coded UI tests through their use of a designer style approach are resilient to changes in the application. Some examples of the resilience were resolution changes, of screens and controls. TIP: do NOT modify the designer files for the tests. TIP: Use ‘TestMethodParameters’ to supply variables into tests. Silverlight support is coming end of 2010 (there’s a limited CTP available). There is NO IE6 support (that’s a good thing). This session was quite straight forward, was just some guidelines to how Silverlight 4 works “out-of-the-browser”, including some demonstrations using COM integration to communicate with Microsoft Office, in particular Outlook to create appointments. Toast notifications, (little msn like popups, ideal for your twitter clients). Signing required so users are not presented with a warning when installing. Checking for updates and performing the update on the application (more so a requirement as it’s now “installed”). For automatic updates signing is a must. Often the intent for out of browser to escape the sandboxed security restrictions. Through elevated trust can interact with COM. COM allows for system interaction, along with other applications, typical example being Microsoft Office. Chris Hewitt walked us through some basic setup and configuration of a WCF based application that makes use of the AppFabric features under the .NET 4 framework and Windows Server 2008. Start using AppFabric, it’s free and just adds some helpful features. 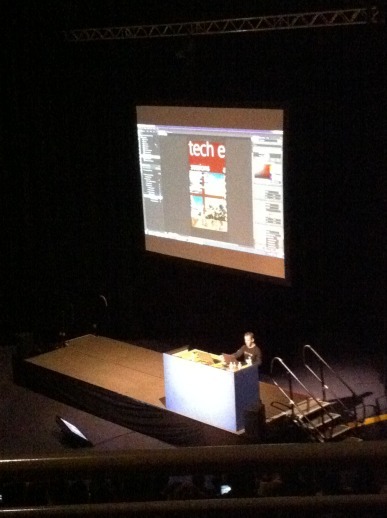 This is one of my top 5 sessions of this years TechEd if not the top one. Joel Pobar and Nick Gunn working for an unnamed Investment Banking institution demonstrated the power of reactive programming. To achieve very highly scalable code and amazing performance. If there was a session that needed an extra 30 minutes allocated it would have been this and the audience would have remained infatuated with what was being demonstrated. This presentation is a must watch, and I’ll be reviewing the video as soon as it’s up. Hardware is nice to have, but make sure you squeeze every last clock cycle out of all your cores. Concurrency and Coordination Runtime – use it. CCR has operation options: Choice, Join, Interleave, Iterators, Causalities. I really enjoyed the lock note as did many others, Miha Kralj was the lock note speaker. Back in Australia 2008 Tech Ed he also gave the lock note and got our attention, and he was able to expand on the ideas he proposed 2 years ago and many of them were well on their way to being realised. What made this years lock note great was that Miha used the PechaKucha technique – 20 slides at 20 seconds each (multiplied by 5) to present 5 interrelated discussions on how information connected the future is becoming. This made for a well flowing and entertaining presentation. Credit is due to Miha himself for being an excellent presenter. The content of his presentation focussed around accessibility of information, and touched aspects of information overload, social media and privacy. He was forthcoming to say that “resistance is futile” when it comes to the requirement to embrace new aspects of digital evolution, and in particular the push from Microsoft to more reliance on their cloud solutions. Client side CPU power on devices is becoming irrelevant. Depletion of IPv4 growing ever closer, a smooth transition to IPv6 isn’t likely. If something can be automated, don’t try to compete against it in human terms. Younger generations dividing line between digital and real world is almost non-existent. “The Cloud augments our emotions”. Online privacy is a myth. Abundance of information, and impact on education (plagiarism issues), interaction with your Doctor. Movement of “happiness in work”, example fiverr.com. Service Remoting – extend soa to cloud eg large mobile workforce. Large scale/quantity of device connectivity. CSS 3 has a lot of power to help achieve dynamic styling through properties like ‘max-width’. User-Agent info on IE 9 is improved (less cluttered). IE 9 ACID 3 tests are on par with the other browsers now. Another of the extensive thought required before blogging presentations. Stay tuned for a separate post link. Then deploy to the web. Queries should not return large quantities of data. The SQL CLR isn’t supported in SQL Azure. SEC308 – How do you secure a cloud? This session turned out to be much broader discussion of security concepts in terms of risk management and general, I went in with expectations of a technical in depth security discussion in terms of software solutions. Reflecting on this, that may have been less than desired, as it would just be repeating known security techniques used everywhere, cryptography, SSL, ect. 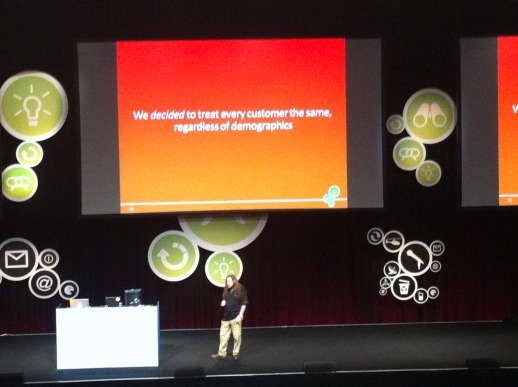 Instead this was a presentation about how Microsoft delivers/hosts/manages it’s cloud data centres. Security is only risk management (in that all IT solutions have security considerations). Microsoft goes to great lengths for physical security of their data centres. Microsoft also has an extensive procedure for secure destruction of hardware at the end of its life. The data centres are quite an interesting piece of server configuration; setup, deployment, cooling methods. Microsoft is investigating running servers at ever increasing temperatures to study mean-time-to-failure. The welcome party is a few hours behind us now and the first full day of sessions is underway. An introduction into Business Analytics / Intelligence, understanding customers, users and the business objectives. Using SSIS to help with decision making, reacting to changes in the customer base (or your data set). It’s likely you need a well organised and well-funded IT department to help facilitate this. “IT Oversight”. 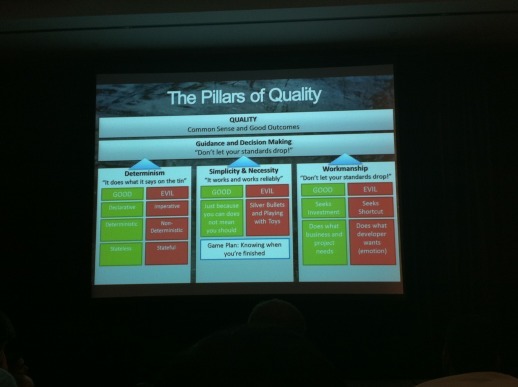 Self learning data quality, as part of data-mining. TIP: Don’t trust Excel Spread sheets to run your business, “even tho it is familiar as a bicycle” –cargo manager failure story. There’s always a need to aggregate and analyse data, individuals will find a way, help them do it better. Summary: How are decisions made? How are they governed? How is the data analysed? Future: reporting and analysis in the cloud (beta coming), more of Dallas (sharing data sets online), Office 15 and more cloud integration, more power pivot, analytics into Azure, next generation user experiences (stunning visualisation using Silverlight) the “wow factor”, Silverlight report viewer (including animations), data mining add-ins, collaborative decision making as part of SharePoint, parallel data warehousing (100s of terabytes), meta data management tracking it’s journey. Basic Structure of a Windows Phone Application (Similar to a Web Silverlight app) falls into this hierarchy: Task Host > XAP > Pages (just like Silverlight) > Content. XNA is different. A Place is defined as a user recognizable collection of persistent state and maps to the concept of a ‘page’. Take not that not all screens are places. Home page (panorama or list). Some list (or set of lists). A details page (once user makes a selection/further action) (soft buttons for internal navigation). A details page of nested item and so on. When obscured by popup – perform a pause action if your application requires consistent user interaction (game/media). Upon deactivation referred to as “tomb stoning” (moved to background) save state and current user data. Some Silverlight 3 components will work. New controls coming: Panorama, pivot, and Map Controls these are the “signature of experience“. Who doesn’t want to be agile? Neatness, care, excellence and common sense. All user action must yield a reaction, even if accidental/off-target, constant UI feedback “no touch left behind”. Learnability > Discoverability = exploratory learning. Identity, negation, reciprocation and correlation = allowing users to be comfortable with their interaction, being able to “reverse it”. Actions that lead to positive action will be repeated, users will stop trying failed actions. The more choices the user has the longer it takes to make a decision. Remove redundancy, but not by “dumbing it down”. Threshold Detection – just enough salience. Clutter is fine, if it’s mine. Not all touches are equal – use the touches appropriate for technology. In this session Chris Auld and Chris Klug did a simultaneous (projector each) demonstration building a basic Windows Phone 7 online store application. This session was a bit intense for the end of the first day, with 2 coders working hard up on screen to complete their piece of the puzzle for the application to function. Azure based back end and the front end interaction on the device. Stay tuned to http://chris.59north.com for the source code of what was produced. 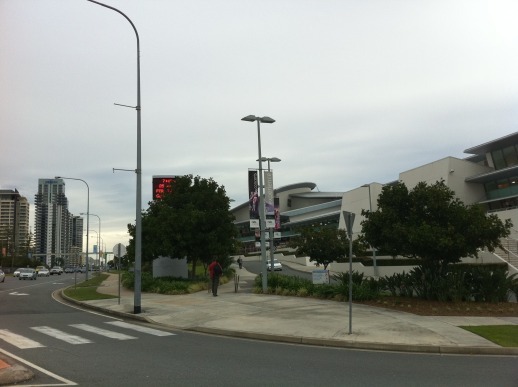 Today I arrived on the Gold Coast for the Australian 2010 Microsoft Tech Ed, it is being held at the Gold Cost Convention and Exhibition Centre. I plan to do a day-by-day summary of the sessions / labs I attend. This afternoon is the Key Note, I’ll update this post with a summary. I plan to tweet anything interesting along with pictures and upload them to my conference flickr account (as soon as I remember my account details to sign into it). Find me tweeting via @NickJosevski. The flight in was fine, the taxi situation not so much. I arrived mid-afternoon at my hotel and have a nice view from the 10th floor. The Keynote kicked off with Michael Kordahi introducing us to the focus of the key note, cloud and actual implementation. Michael handed off to August de los Reyes who works at Microsoft HQ in Seatle, and has been responsible for some key strategic design decisions at Microsoft, including the Windows Key on ALL keyboards, and more important things like Surface and Windows (what August had to say was great, and is a fantastic speaker). 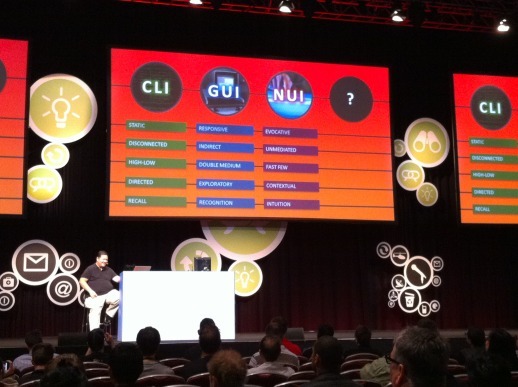 Extrapolate from CLI (command line interface) and GUI (graphical user interface) to determine what NUI (natural user interface) needs to be. What comes next after NUI? The Microsoft Surface and NUI is so much more than “touch on a table”. After this breath of fresh air unfortunately* for some of us it returned to the selling of the 3 screens and a cloud many screens and the cloud sales pitch for Foxtel. 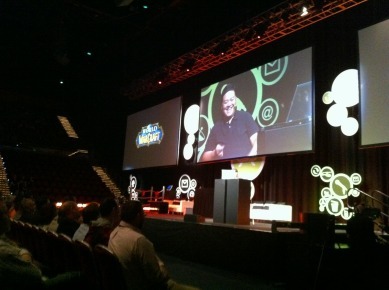 Having attended ReMIX earlier this year in Melbourne there was nothing new year, and in fact the presentation tho more practiced and polished was rushed and real in depth discussion was lacking. The Foxtel experience was about the Surface, tablet devices and Windows Phone 7. I would have liked to have seen something more advanced with the Foxtel idea, a bit of discussion about the implementation behind the scenes, it was just a little too “fluffy” for me. I may have unrealistic expectations, coming from in depth but much longer Key Notes from Microsoft on events like PDC and MIX. *Only unfortunate if you’re attending many of these Microsoft events. The next part of the Keynote focussed on what’s coming up with windows phone 7, in particular games and xbox live interaction.Dave Glover presented a few new applications Domain.com.au, A Tower Defense game, Deck of Secrets, and Telstra One/Life (need to confirm the names). 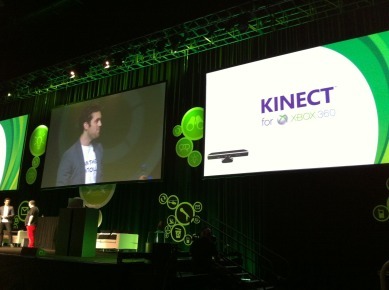 This allowed for a segue to let us know that Kinect will be on sale world wide in November. We got a walk through of the body and object detection system with an on-screen display. “Be Awesome.” — end of Keynote. The welcome event was just dinner and the exhibitor booths. There was also some quick 30 min intro sessions that ran between 6:30 and 7:30 that suffered from the show floor noise, but were still great to be running.